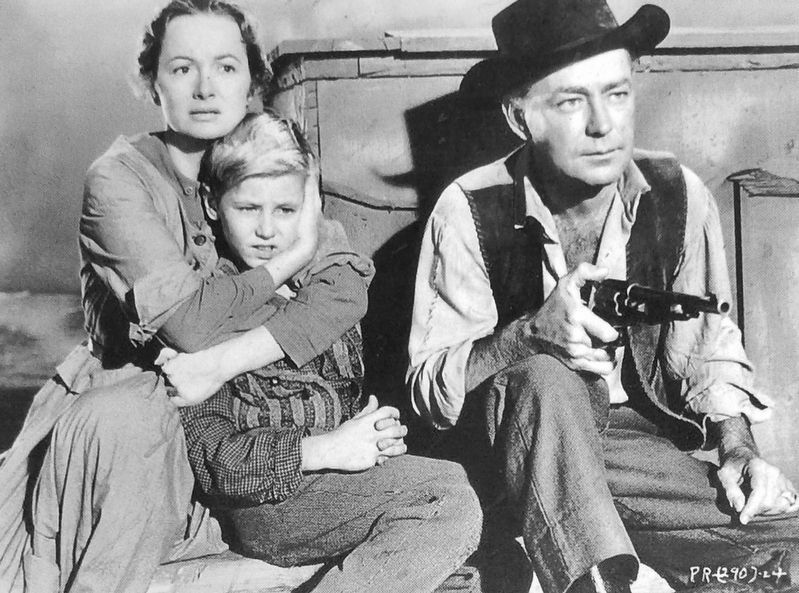 Alan Ladd, Olivia DeHavilland and David Ladd all came to Southern Utah in 1958, for scenes on Cedar Mountain and Johnson Canyon, in director Michael Curtiz' production of "The Proud Rebel". The film co-starred Dean Jagger and John Carradine, it was produced by Samuel Goldwyn Jr. and released by Walt Disney Studios. Location. 37° 2.554′ N, 112° 31.591′ W. Marker is in Kanab, Utah, in Kane County. Marker is on South 100 East (U.S. 89A) south of East 300 South, on the right when traveling south. Touch for map. Marker is located beside the sidewalk, on the west side of the street, directly in front of the restaurant at this address. 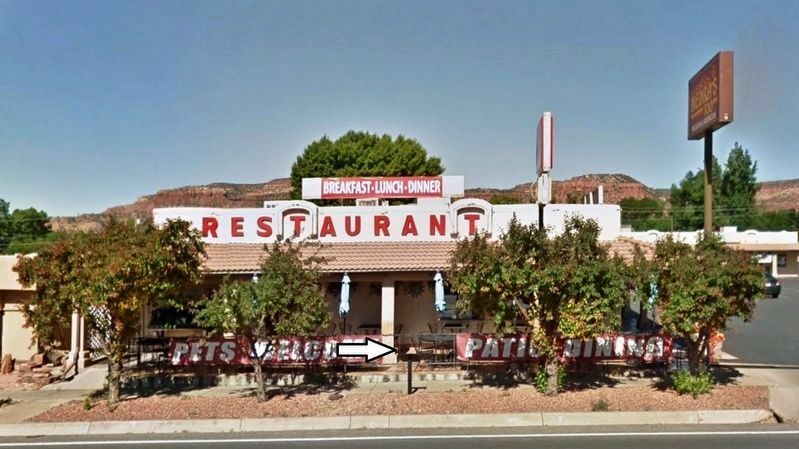 Marker is at or near this postal address: 310 South 100 East, Kanab UT 84741, United States of America. Touch for directions. 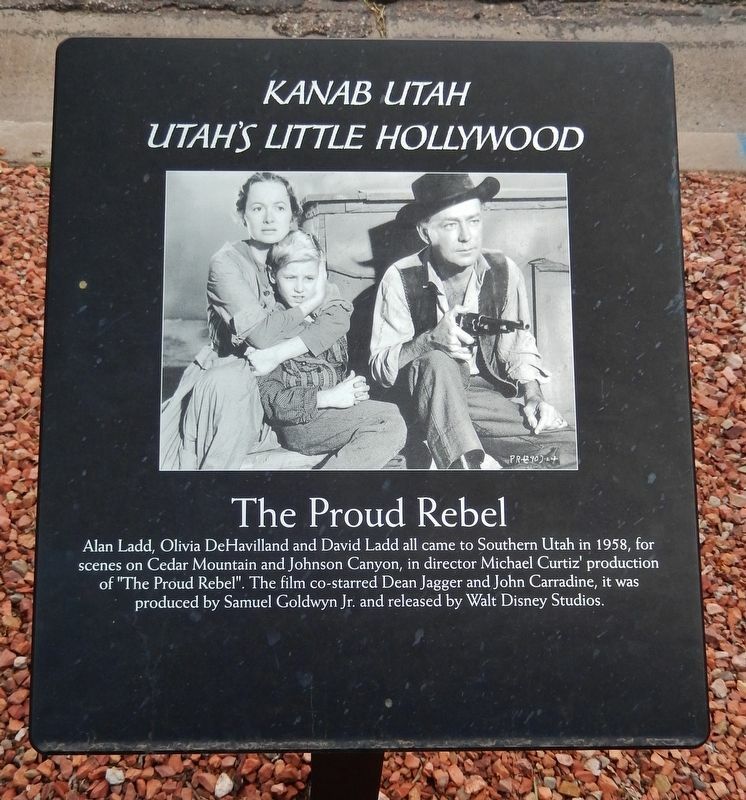 (within shouting distance of this marker); Ava Gardner & Howard Keel (about 300 feet away, measured in a direct line); Dub Taylor (about 400 feet away); Jack Nicholson and Will Hutchins (about 500 feet away); Marty Robbins (about 500 feet away). Touch for a list and map of all markers in Kanab. More. Search the internet for The Proud Rebel. Credits. This page was last revised on March 8, 2019. This page originally submitted on March 7, 2019, by Cosmos Mariner of Cape Canaveral, Florida. This page has been viewed 87 times since then. Photos: 1, 2, 3. submitted on March 7, 2019, by Cosmos Mariner of Cape Canaveral, Florida. • Bill Pfingsten was the editor who published this page.